Tomato paste & jam machine and with any brix and packing in cans,jars.Supplying reliable tomato paste processing equipments. 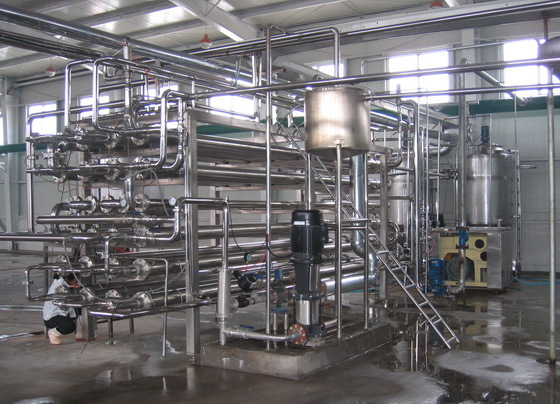 A, Including elevator, washing system, sorting system, crushing system, pre-heater, pulping system, vacuum concentration system, sterilizing system, aseptic filling system. 1) This line includes multi-function crushing machine, which can produce onion paste, carrot paste, chili paste, apple paste and many other fruit jam. 2) Because of the following factors such as crushing action, ultra-low temperature evaporating(single-effect evaporating temperature is 68),the two-effect and two-section structure makes staying time of the material is short in evaporator, the lycopene and other nutrition of paste has little loss than other equal equipment, the L valve is also higher than other equipment such as three-effect and three-section, three-effect and four-section. 3) The electricity consumption is less than 400KW/H than other equipments with equal capacity. 6) The screen of the pulping machine is taper, the clearance could be adjusted, also could be frequency conversion and timing, which makes the production easy to squeeze. Please contact us for more details about tomato paste production line.